Toni Wellman, a multi-million dollar broker/associate with Big Block Realty in La Mesa, CA. She has over 40 years experience in San Diego County Real Estate. A native Southern Californian, she has first hand knowledge of this city’s growing communities and changing lifestyles. She began her career in San Diego with Art Leitch in 1977 and over the years has established her reputation by professionalism and accomplishment at CENTURY 21 and then Keller Williams. Her ability to handle all sides of the Real Estate equation from first time buyers pre-qualifying questions to involved 1031 exchanges on multiple income properties to the current dilemmas in short sale mediation has earned her a business that is largely referral based. She also passed the Hawaii Real Estate Exam and actively pursued a career there from 1994-1997 while her husband Dale was stationed in Honolulu. He retired from active duty in 2009 and is currently a government employee. In San Diego, she specializes in the East County which includes; La Mesa, Lemon Grove, Spring Valley, Granite Hills, El Cajon and Rancho San Diego. While she has watched these communities grow, her repeat and referral client’s needs also take her to Oceanside, Alpine, South Bay, Temecula, Carlsbad, Del Mar, Chula Vista and Menifee on a constant basis. There is no area in San Diego or Riverside counties that is unfamiliar. Among her many awards are several from the San Diego division of the Building Industry of America (BIA) for her outstanding work with developers, the Centurion Producer 2000 – 2009 with CENTURY 21, and designation of Gold Medallion Award winner with Keller Williams La Mesa. But her most treasured kudos are those for quality service to her clients gathered every year! 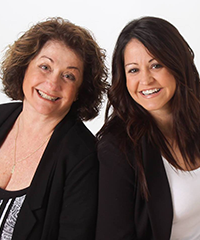 She was joined by her daughter, Natalie Hanson, in 2005 to meet the growing needs of their expanding client base. They are the personal Realtors for over 300 San Diego families; having assisted them, their friends and their families in multiple transactions. If you have been directed to this website by one of those friends or family members please share that information with our team.